Students look on as guest poet Carlos Andrés Goméz shares his cultural heritage through poetry. In conjunction with Hispanic Heritage Month, TWU’s Campus Activities Board and Diversity, Inclusion and Outreach collaborated to bring Hispanic Heritage Poetry Night, with award-winning spoken word poet Carlos Andrés Goméz. 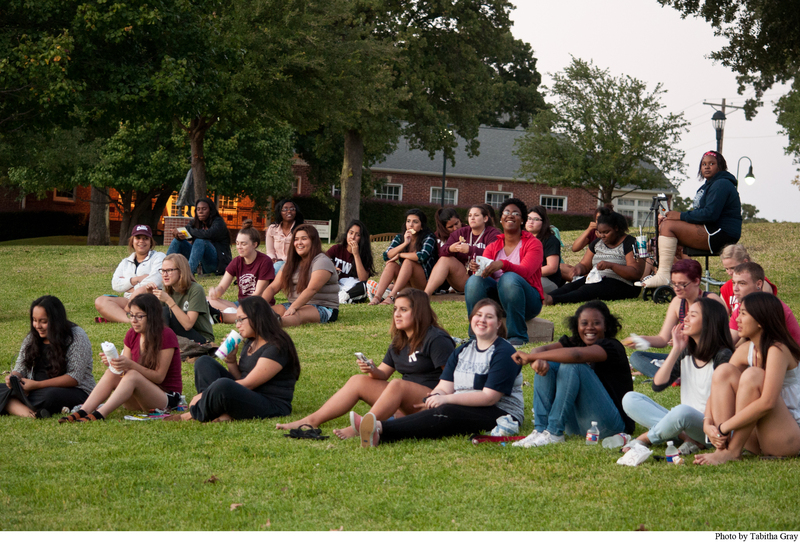 The spoken word performance took place on the lawn of the Jones Hall Green Space, across from Hubbard Hall. In an interview, CAB Public Relations Coordinator Bailey Whatley explained how Goméz was invited to perform for Hispanic Heritage Month’s Poetry Night. Students in attendance gathered together in groups or individually to hear Goméz speak. His positive energy and warm performance elicited many reactions, from applause to laughter and even understanding from members of the audience as Goméz spoke about everything from his cultural heritage to different aspects of identity. After his performance, Goméz signed copies of his book Man Up: Reimagining Modern Manhood for students in attendance as well as flyers, taking photos with students on their cell phones and offering warm introductions in the form of hugs. He also shared the reason behind his passion for spoken word poetry. Goméz added that he felt spoken word is meant to be a dynamic journey that allows listeners to feel a colorful mix of emotions. Most importantly, he hopes that the audience walks away with an experience that they can look back on as positive and fulfilling through the more difficult times of their lives. For more information on CAB events please visit http://www.twu.edu/student-government/campus-activities-board.asp, or follow CAB on Facebook, Instagram or Twitter @TWUCAB.